Asphalt rejuvenator being applied – Photos by Asphalt Restoration Technology Systems Inc. I am pretty sure that if you spent your winter months soliciting bids for a paving project, then you are probably more confused now than you were when you started! Understanding the lingo of the asphalt industry can be tough if you are unsure about what you are wanting and even tougher if you have no idea! To help you understand some of the options available in the Florida market for surface treatments or replacements, I am hoping to get you and your community on the right track. Sealcoating—Sealcoating is a water-based coal tar or asphalt emulsion that is designed to coat the surface of your pavement. It is applied in a two-part process, and most products are 30–35 percent water with two to three pounds of sand added per gallon. Some are premixed, and others are left up to contractors to mix. The manufacturer recommends that drive lanes and turn areas have three coats applied; however, rarely does a community take on the added mobilization, not knowing that it might help their property look better longer! This product is recommended if a community has already started a sealcoating program or if they have an area on the property where they want to refresh the appearance, such as a clubhouse or sales office. Sealcoating can be a more economical surface treatment and is also one of the easiest to adulterate, so be sure to confirm that your contractor is mixing and applying it according to the manufacturer’s specifications. 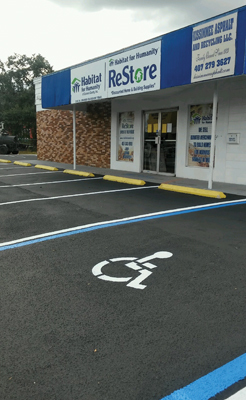 Rejuvenators—Asphalt rejuvenators used to be known as a specific type of surface treatment that was designed to replenish the lost maltenes in your pavement due to oxidation. Nowadays, the industry has begun to refer to some standard sealcoats as “rejuvenators,” meaning that they rejuvenate or refresh the appearance of the community, but they do not necessarily provide the asphalt conditioning for which the original rejuvenators were intended. This product is recommended for untreated, virgin roadways that have not begun a surface treatment with sealcoating. True asphalt rejuvenators, if applied correctly, can extend the life of your pavement four to six years with each application. Please be aware that some products are best applied within the first three years of a new asphalt cap and may not provide aesthetic appeal or protection from fuel spills. Micro surfacing/Micro paving —These can be referred to as sealcoating with extra aggregate or can be a regular asphalt mix with smaller stones. The sealcoat version can fill in defects on severely cracked sealcoating properties that are trying to add some more years to their pavement before paving. These products are usually proprietary and have limited availability via distributors. These products are suggested when a community has minimal funds available and needs to refresh their appearance for a little longer than sealcoating. These products can last up to 10 years, depending on traffic patterns, and can buy a community some time while building up their funds for a mill and overlay later on. Asphalt Overlay—An overlay can be as thin as ¼-inch and as thick as you want it as long as it’s installed in a maximum of 2-inch lifts. 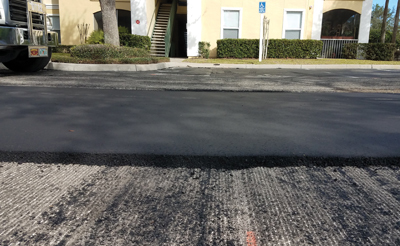 Most properties in Florida have a 1–1 ½-inch lift in place, and those elsewhere in the country can have up to 9–12-inches of asphalt if they live in the colder climates where they have a freeze/thaw cycle. Those asphalt companies in the northern climates can actually mill off their surface a bit if they have a friction issue and recreate a brand-new road by just skimming an inch off the top. Here in Florida, if we skin off an inch, well, some of us wouldn’t have a roadway! My standard recommendation in Florida when installing a new overlay is at a depth of 1 ½ inches compacted. This depth is a good mix to hold back the reflective cracking a little longer and give the community a little more time before having to overlay again. Please note that you must have a good, stable existing asphalt cap for a new overlay to work. If you try to overlay a defective asphalt cap, think of it as trying to install tile on top of shag carpeting. It will look great until somebody walks on it! The same goes for asphalt! Also, please keep in mind that if you have curbs and gutters, you might not be able to install a new asphalt overlay without milling out the existing asphalt cap. Take note of the height requirements of covered parking when adding a new overlay. I have customers with residents who can no longer use their carports because their vehicles are too tall! Transition Milling and Asphalt Overlay—This process is where the contractor comes in and mills out the existing asphalt along your curb line, hardscapes, sidewalks, and aprons and creates what I like to refer to as a “footer hold” for your new overlay. The areas where the milling took place could be as thick as a couple of inches, but the crown of the road or parking lot typically has about a 1-inch average. 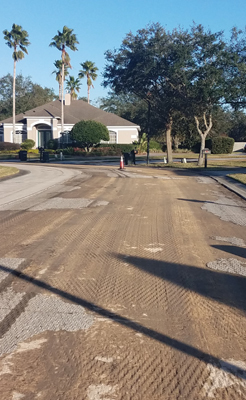 Transition milling can save communities thousands of dollars as opposed to a full mill, but please make sure that you are fixing any defects before installing the new asphalt! When milling parking lots that have inverted drain lines, sometimes it might be better to zero out your milling at the end of the stalls and take your full depth to the center of the drain line in order to improve water flow if you are having water flow issues. If you have a roadway with an inverted drain line, you can zero out the mill at your curb line and pull it into full depth at the drain line. When looking into any type of overlay, whether it includes milling or not, please always take into consideration things like driveways, curbing, gutters, access ramps, etc., as ignoring some of these items can cause your water flow to go backwards and flood your driveways, and that is not an easy fix after the fact! I know these words sound intimidating, and if it’s still not something that you can understand, please don’t jump into this thinking that you can “fake it till you make it,” because you can’t. There is no learning curve when it comes to your pavement. If you want a rejuvenator but refer to it as a sealcoating, you will never be able to apply a true rejuvenator on top of the sealcoat. If you want an overlay and see that a bid is $20,000 cheaper, make sure it includes milling if you need it. If you skip this part, you will see reflective cracking appear within months of your new overlay, and in some cases weeks. We are paying a higher price for a lesser quality product that has only a 12–15-year life expectancy. If you have a budget that says your 1-inch overlay has a 20-year life expectancy, you better get that checked out, as we haven’t had asphalt last 20 years for more than 25 years! You don’t want to fall short by underestimating your needs or overestimating your life expectancy. If none of these words make sense to you and you just don’t get it, call me or email me, and I will help you out! 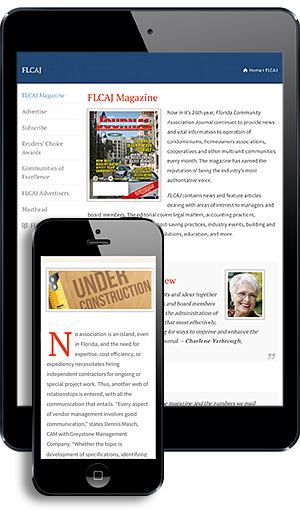 Asphalt Restoration Technology Systems Inc. (AR Tech) is led by Connie Lorenz, also known as the “Asphaltchick,” and provides education and consultation services on proper asphalt maintenance. As a multi-year recipient of the Florida Reader’s Choice Award and Pulse of the City Awards, and one the of Top 50 Asphalt Contractors in the country four years and running through Pavement Maintenance and Reconstruction Magazine, we are the team to turn to! We provide a no-cost, detailed evaluation, property specific, with our proposals and offer board presentations to explain the different options available for pavement maintenance today. For more information on Asphalt Restoration Technology Systems, call (800) 254-4732 or visit www.asphaltnews.com.